Before editing DB engine parameters, lets know about DB parameter group. We can manage DB engine configuration through the parameters in a DB parameter group. A default DB parameter group is created while creating new DB instance. We cannot modify the parameter settings of a default DB parameter group directly. If we want to edit any existing parameter value then we must create new custom DB parameter group rather than default group. Once you create custom DB parameter group, it will show you all the parameters in list and details like which parameters are editable, default value and parameter type for example dynamic or static. When we edit a dynamic parameter and save, the change is applied immediately regardless of the Apply Immediately setting. When we edit a static parameter and save, the parameter change will take effect after you manually reboot the DB instance. When we change the DB parameter group associated with a DB instance, you must manually reboot the instance before the new custom DB parameter group is used by the DB instance. The parameter value can be specified as an integer or as an integer expression built from formulas, variables, functions & operators. Note: Improperly setting parameters in a DB parameter group can have unintended adverse effects, including degraded performance and system instability. You should try out parameter group setting changes on a test DB instance before applying those parameter group changes to a production DB instance. 1: Sign in to your AWS Management Console and search "RDS" in "AWS Service" search box. 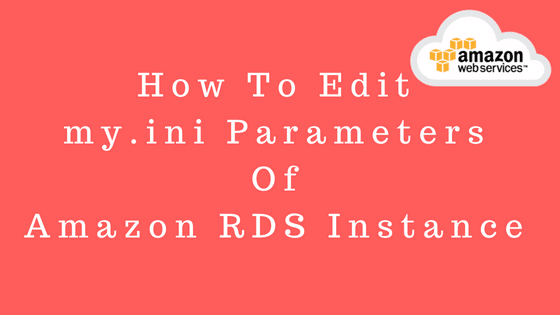 2: Once you find RDS service, Open that Amazon RDS console page. 3: On left side panel click on "Instances" menu, then click on your "DB instance"
5: Select "Parameter group family" as per your default parameter group,in my case I will select "mysql5.6"
8: Then click on "Create" button, it will create new custom Parameter group. 10: Click on that new custom parameter group, You will see "Parameters" filter option. 12: You can add value from range mention in "Allowed values" column of that parameter. like 1-31536000 for "wait_timeout" parameter. 13: Once you done with changes, click on "Save Changes" button, It will save all recent parameter changes. 14: After this we need to associate this new custom parameter group to our DB Instance. 15: On left side panel click on "Instances" menu again, then click on your "DB instance". On the right top corner click on "Instance Action" drop-down then click on "Modify" menu. 16: You will see "Modify DB Instance" page, Now scroll down and go to "Database options" section and select newly created custom parameter group from "DB parameter group" dropbox. 17: Click on "Continue" button, It will take some time to apply new parameter group. 18: Once done Step 17, Again On left side panel click on "Instances" menu, then click on your "DB instance". On the right top corner click on "Instance Action" drop-down then click on "Reboot" menu.